The Salvation Army deployed a local emergency disaster teams and equipment in response to Hurricane Michael, which roared through Florida’s panhandle and southeast Georgia earlier this week leaving behind a trail of destruction. Lieutenant Shane Owens of The Salvation Army Montgomery County Corps departed the Washington, DC region yesterday. Owens is joined by two local volunteers, both from Northern Virginia. 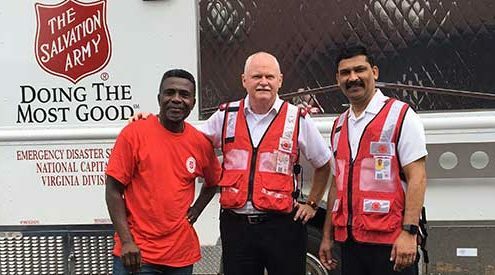 The team will serve emergency responders and residents affected by Hurricane Michael from The Salvation Army’s FedEx disaster canteen. Trained emergency disaster personnel provide food, hydration, and emotional and spiritual support to survivors and emergency first responders. The Salvation Army mobile feeding disaster canteens can serve 1,500 meals per day. The canteens carried food, water, and snacks. The best way to support the survivors of Hurricane Michael is by making a financial contribution. This gives relief organizations flexibility to quickly and efficiently meet the immediate needs of disaster survivors without incurring many of the costs associated with sorting, packing, transporting and distributing donated goods. Please designate ‘2018 Hurricane Season – Michael’ on all checks. We will provide additional updates as they are made available.